So many of our [word only David Ortiz can get away with] city's athletes really do give a genuine, heartfelt damn. This is so obvious to us now. We've seen the true bond between the Red Sox and the survivors and first responders a couple of times now, and the warmth of the moments never fail to send the tear ducts into overdrive. Ortiz, gifted with that innate ability to treat everyone like a long-lost friend, has been at the forefront with open arms in tragedy like he so often has been in victory during his 12 years in Boston. But he is not alone, on his own team or across teams. So many of Boston's athletes stand with him. The Bruins are low-key in terms of seeking publicity but go above and beyond when it comes to generosity. (Hockey players, you know.) The Patriots and Celtics open their hearts and wallets, as franchises and individuals. It's a small part of the recovery, but make no mistake. What they've done in the last year does matter. The finest athletes aren't always like us. They're talented in lucrative, noggin-swelling ways that breed aloofness and detachment. They're often not so much residents of the cities in which they play as they are highly-taxes visitors whose length of stay depends upon the next contract. That is not the case in Boston, not for those who were here last April 15 and the aftermath. They get it -- the regional and generational meaning of the Marathon and Patriots Day and early-afternoon ballgame at Fenway. That's why Andrew Ference, no longer a Bruin, was volunteering at the finish line today. He's moved to Edmonton, but Boston has never left him. The wise-guys among us may even suggest Clay Buchholz's short afternoon of work at Fenway was his way of getting over to the finish line -- a planned postgame destination for some of his teammates -- before all the elite runners completed the 26.2 miles. Tedy Bruschi ran Monday. His was a wonderful gesture of determination, the sort of thing that made him one of the most beloved Patriots of all time. But among all of the 32,000-plus competitors, there was one competitor who carried a unique combination of understanding what the Boston Marathon means and having an opportunity to play an affirming role in the redemptive, joyous and cathartic vibe of the day. 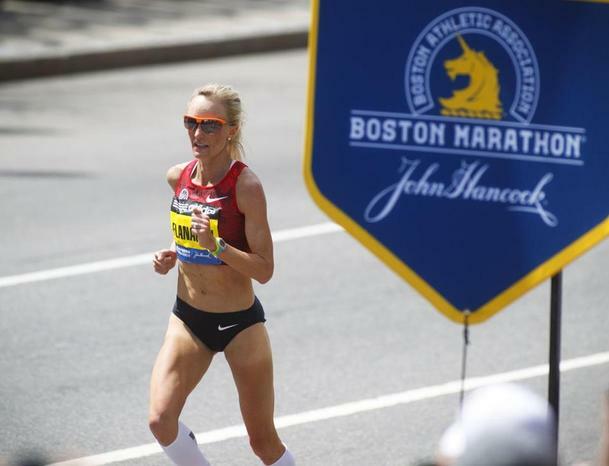 Shalane Flanagan, the daughter of Marblehead, knows the terrain of the Boston Marathon course down to the last frost heave. Last year, she finished fourth in the women's race. She was in the athletes' dining area when the first bomb went off. The athletes were quickly sequestered, but that did not delay the horrible reality of the situation from quickly setting in. Shock was the initial emotion. But as the weeks passed, "I was just p----- off that someone did this,'' she said. That anger enhanced her determination. Six times since September, she ran the Boston Marathon course. "I have fallen in love with this course. I had so much fun preparing for this race. I wanted to use that as an advantage,'' she said Monday. "That's why I wanted to attack this course today, to give it everything I had. I knew every little divot in the road. I knew where every Dunkin' Donuts was, where every Wendy's was. I have some great memories on this course. It was such an enjoyable process. My dad would come out and drive the course, and I just had a really, really fun time preparing. It's been an amazing journey." Her journey did not end the way she hoped. She finished seventh, with Kenya's Rita Jeptoo pulling away over the final four miles to win the women's race for the third time. But did she ever give it a shot. Flanagan led in essence for the first 19 miles, falling back only during water breaks and quickly seizing the lead again. But her pace was well past her personal best, and the skepticism of the analysts who said she could not maintain proved correct. She was determined to win. Ultimately, she could not, and her disappointment occasionally broke through her competitor's stoic mask. "I just love Boston so much,'' she said during a brief interview with Channel 4 after crossing the finish line with a personal best of 2 hours 22 minutes 2 seconds. "I just wanted my love for Boston to be portrayed through my race today." Had Flanagan somehow kept that lightning pace to the finish line, she would have become most beloved female Boston Marathon runner ever. It was the athlete who holds that title, Joan Benoit Samuelson, who advised her on her approach today. "I have a good friend, Joan Benoit Samuelson, and for years now she's told me to run my own race. So today I wanted to go out and do just that, to run my own race and see if it was good enough to win the olive wreath. So I went for it. It was a no-excuse day, absolutely amazing conditions." Flanagan, who got choked up at times during her post-race press conference, said her emotions didn't get the best of her or lead her toward taking an unwise approach at the beginning of the race. "It was obviously an amazing day for Boston and our nation, and I just wanted to put on the best performance and have whatever I had in me to pour out onto the streets,'' she said. "I literally ran as fast as I could." She said it was only toward the end, when overwhelmed by the crowd's support over the past couple of miles, that her feeling began bubbling to the surface. "I felt like I was actually hyperventilating a little because there was so much love,'' said Flanagan, who noted that Bruschi told her it felt like the entire Marathon field was the fifth major Boston sports team today. "It was like a stadium lining the whole course. My insides were almost shaking it was so loud. My ears almost hurt. It's something I'll treasure forever." Flanagan said she waited three days or so after last year's race to let the organizers know she planned to come back this year. "I wanted to send a message that it's safe to be back here,'' she said. "I wanted so much to be a part of this day." This year, she didn't even wait that long. Flanagan said she would be back next year. "I'll keep running until I win,'' she said. Winning this time would have been wonderful. Her victory would have become a part of Boston's lore, even beyond sports. But as the battered Patrice Bergeron and the Bruins reminded us last June, an extraordinary effort in defeat should always be respected. Flanagan was stronger and more determined than ever, and she isn't about to give up now. Those qualities sure sound familiar. Yeah, this is her city. Watch Chad Finn's thoughts on the men's first place finish below.